RSA Member Memorial Plaque Plate and Memorial Book Listing - $100: This option is available to RSA Members and includes both a memorial plaque plate and a page in the memorial book. (Information for book will need to be supplied separately and assembled by donor. This can include a photo and one page of written information. Any material submitted will be reviewed by the Honors Committee for appropriateness prior to inclusion to the book.) Please email memorial book content and photo to: honors@rollerskating.com once completed filling out form. Friends and Family Memorial Plaque Plate - $100: This option is available to non-RSA members to memorialize friends or family of the roller skating industry. Donation to the Roller Skating Foundation: The RSA will send an acknowledgement of the gift to the family memorialized. Please let us know where you would like this sent and the name/names to be used, as well as your information. You may complete and submit the form below or download the fillable PDF form here. 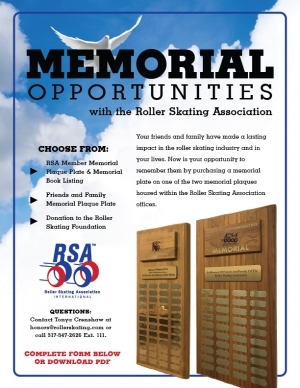 * NOTE: If you are purchasing an RSA Member Memorial Plaque Plate and Memorial Book Listing, please make sure to email your memorial book content with photo of the individual being remembered to: honors@rollerskating.com. Name and information for plaque plate. Includes three to five lines with 30 characters or spaces per line. Once you have submitted this form you MUST contact the RSA accountant to make your payment. Contact Tonya Crenshaw at honors@rollerskating.com or call 317-347-2626 Ext. 111.